Southern Regional Master Gardener Conference a Great Success! Natchez, Mississippi was the site of the 2012 Southern Regional Master Gardener Conference held May 1 – 4 that involved more than 500 master gardeners from 11 southern states attending. 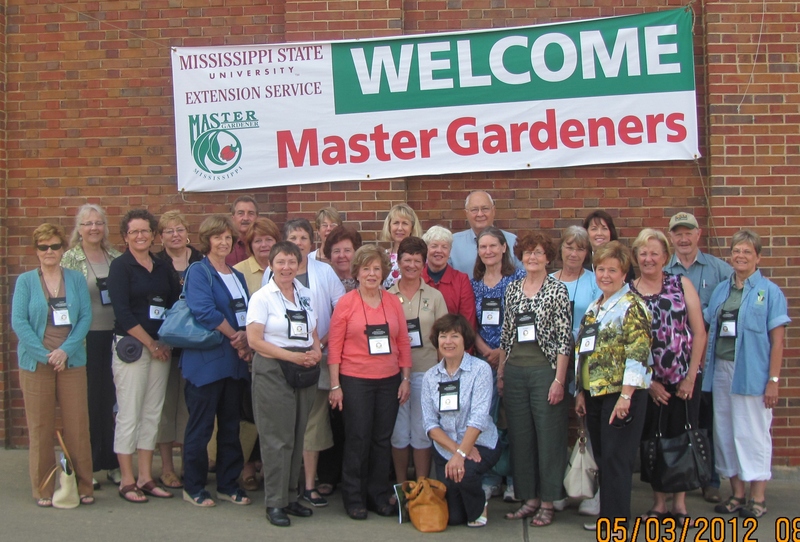 The conference hosted in partnership by the Mississippi Master Gardener Association and the Mississippi State Extension Service provided conference participants an enjoyable experience through delivering outstanding accommodations, gracious hospitality, and excellent educational programs. The Louisiana delegation involved 34 master gardeners from around the state that represented 7 Louisiana Master Gardener Association programs. A group picture of the Louisiana delegation is below. The next Southern Regional Master Gardener Conference is scheduled for 2014 to be held in Louisiana. As a site for this special event is still to be determined, comments on recommendations are welcomed. Garden and research plot tours, food sampling and music will be featured at a morning-long Garden Fest at Burden Center on June 30 at the LSU AgCenter Burden Center in Baton Rouge. From 8-11 a.m. visitors will have an opportunity to take a hay ride to the Burden Center research area to hear about research with tomatoes, watermelons, peppers, cover crops and fruit crops, according to Burden resident director Jeff Kuehny. They’ll also get to participate in selecting the outstanding tomato variety in the trial garden. Other garden tours will include the All-America Selections garden and a children’s garden. The Burden Center Midway will feature displays from the East Baton Rouge Master Gardeners, the Burden Horticulture Society, the Camellia Society, Herb Society, Bonsai Society and garden equipment companies. Experts from the LSU AgCenter will conduct a plant health clinic and diagnose problems with plant specimens visitors bring to them. The Louisiana Department of Agriculture and Forestry and the Louisiana Egg Commission will prepare and serve omelets from 8-9:30. And a fresh tomato bloody mary contest will be held from 9:30-10:30. The Louisiana Culinary Institute and the East Baton Rouge Parish extension office will offer samples of dishes prepared from vegetables produced at Burden Center along with nutrition information for each selection. Baton Rouge Music Studios and Visit Baton Rouge will provide live music in the All-America Rose Garden from 10 a.m. to 1 p.m. Baton Rouge food trucks will be selling food and the LSU AgCenter Dairy Store will be selling ice cream from 11 a.m. to 1 p.m. Admission to the event is $5 per person. The Burden Center is located on Essen Lane off I-10 in Baton Rouge.